We have enjoyed spending time in different parts of Chiswick House and Gardens this week. We started off in the meadow across the pond where the children have enjoyed a new space to role play in. There has been lots of talk around robots this week with the children demonstrating how they would move if they were to become robots. They would then use the fallen tree as their space ship ready to fly off into space. 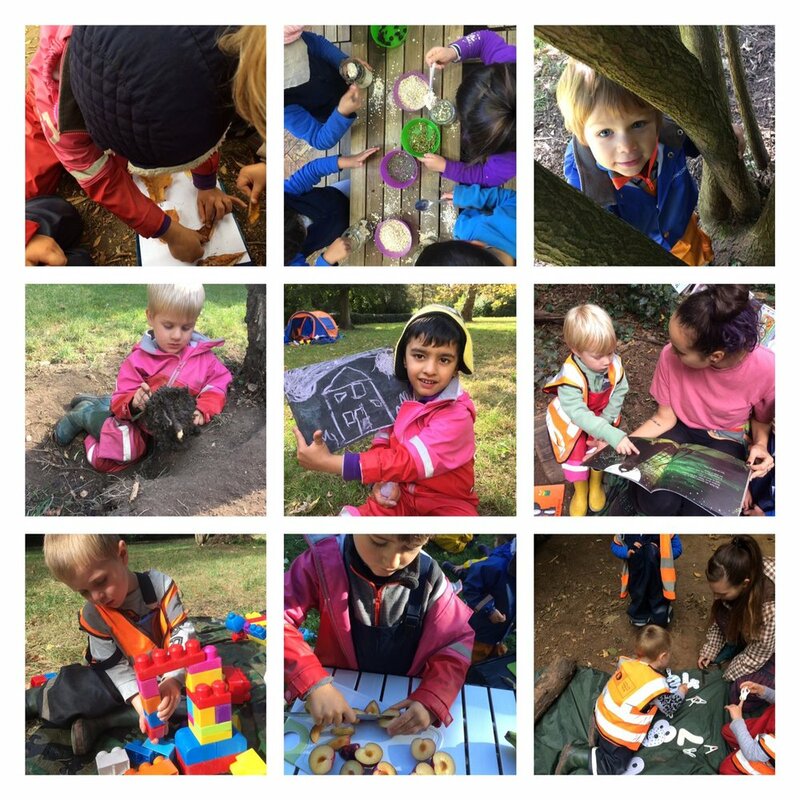 We took the building blocks into the forest this week which gave the children a lovely opportunity to practice their construction skills. There were lots of different shaped houses and boats being built. One child made a crane that picked up blocks as well. They were all demonstrating great sharing amongst their peers taking turns to each have a go at using the building blocks to create their masterpieces. Rachel has been kind enough to harvest some of the vegetables for us this week that have been growing in our garden. She brought some of the beans back to piccolo where the children had fun picking each bean out of their cases. It was amazing to see the colours that the beans had turned! They looked almost magical! The children were counting and sorting them into different number groups by matching the amount and numeral written in a box for numbers 1 to 6. The children have been enjoying their weekly cooking lessons with Nafisa too! This week they were making their very own Bircher muesli. They were given all of the ingredients which they needed to pour into a jar and mix together. They would measure out how much they needed of each and stir it all in together finishing with a drizzle of honey. We hope they enjoyed eating it for breakfast the next morning! We have ended our week on the opposite side of the garden under some big chestnut and oak trees. We have noticed how many leaves were falling like snow and the children took on the challenge of finding the matching leaf shape drawn by Kellie on paper. There were big leaves and small leaves to find. We had some success but looking forward to continuing this activity in the autumnal weeks to come!